Read-out Instrumentation Signpost: Succesful Food & Pharma Symposium completed! Succesful Food & Pharma Symposium completed! 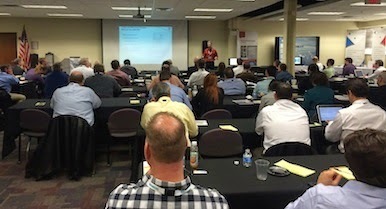 Nearly 130 professionals within the automation and control field and the pharmaceuticals and food industries gathered in Philadelphia last week to explore solutions to the critical challenges relating to automation in food processing and drug manufacture and distribution. • ISA’s 2016 FPID Symposium is tentatively scheduled to take place 15-16 March 2016 in Cork (IRL). Symposium organisers are already recruiting volunteers, participants and speakers for the event. Dual input Smart HART temperature transmitters. Web pages renewed and introduce new products! Industry forum for Amsterdam next month! VP Sales chiefv for EMEA! Aspiration smoke detection applications guide! Housing offers versatile mounting possibilities! FDT Group Sponsoring Member announced!